Everglades Holiday Park Review by Rose Alexis | Everglades Holiday Park: We Took an Airboat Tour of the Everglades!! Disclosure: This post is sponsored by US Family Guide and Everglades Holiday Park. This is a good friend of mine and my kids are lucky enough to call her aunt. She looks sweet and innocent, but I'm telling you, she's a crazy woman when it comes to adventure! For the last 13 years we've lived in separate states (though we did visit each other from time to time. She even flew up to Michigan to help decorate my youngest son's nursery...yeah, that's a good friend). That means we've got a lot of fun time to make up for, and to help us do that, this summer we've created a 'bucket list' of sorts that we're slowly ticking off one by one. Some of the things she puts on there really stretch my adventure zone. ;) I'm no slouch in the adventure department, mind you. I'll travel most anywhere, ride any rollercoaster, and I really am down with trying new things... but some things make me nervous...like driving fast, airboats (just never mind), and white water rafting (something on her list we haven't done yet *gasp*). I will admit though, when I go along with her on these events, I do always have a grand time. This trip was no exception. We recently took the drive down to Ft. Lauderdale and while there we visited the Everglades Holiday Park (another thing we did on my birthday weekend) . My son and blue-tongued daughter just before the airboat ride. Crashley Ashley took us out on the boat. That's the nickname she told us was hers, just before she took us speeding over the alligator, crocodile and python filled water of the Everglades. ;) She was actually a very safe driver though, and the ride was not only fun, it was informative. The vehicles have marine-grade speakers on them, and a noise reduction system so clear it means you don't need headphones & you can still hear every single word your driver is saying. The boats run on twin engines (800 hp), so yeah...those suckers fly! They're actually very comfortable though, with a glass shield in the front and a completely covered top (so you don't end up drenched or getting a sunburn, depending on the weather). You settle in comfortably on the bench seats, and just sit back (or lean forward, depending what's alongside of the boat) and enjoy the ride. You'll see a lot of vegetation and hear about the environment while you're moving along. Some of the things you will learn are fascinating (like the pythons are trying to dominate the alligator population), you will hear things that are sad (The Everglades are improving but they are still in trouble! ), and you will see some things that make you smile (like the colorful birds hopping from leaf to leaf, following alongside our boat). and you will see some folks who are out there doing their own thing. The boats leave every 20 minutes and the tours last an hour. They run 7 days a week, rain or shine. You can a free 5 x 7 photo of yourselves too, with the boat area as the backdrop, before you board for your tour (love this perk, photos are my favorite souvenir!). Before or after your boat ride, you'll also have a chance to watch an expert interact with the alligators. 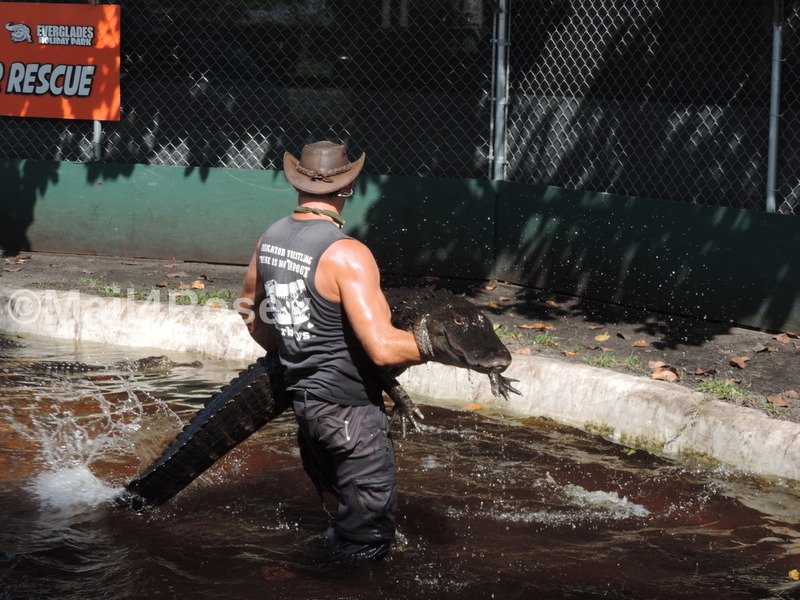 All of the gators are animal rescues. taken out of places like your neighborhood pond or canal. They keep them contained because alligators are territorial and known to find their way back to where they came from... who knew??? I forget the gentleman's name who ran the alligator show (my daughter knows it, she's a fan of all the Gator Boys) did a great job!! I'll tell you what though, I wouldn't take his job for a million dollars. In fact I wouldn't take it for two. Probably because just before he did this photo opp, he told us a gator could instantly snap bones or crush a a human head. When he let go of the gator you see above, its jaws made a hard, fast popping sound. I'm not going to lie, I jumped. We learned some cool facts though (no spoiler alerts here), and came out with a better understanding and even more appreciation than we had going in, of the alligator population. All in all it was a wonderful day and we learned quite a few things. You should know that Everglades Holiday Park Park received over 350,000 guests last year, has received a certificate of excellence for five years running (including for 2016), and it consistently ranks in the top ten (out of 121) for things to do in Ft. Lauderdale, Florida (on TripAdvisor). They've got a great upgrade coming too (again, no spoiler alerts here), but stay tuned, it's going to be fantastic. Learn more about Everglades Holiday Park by visiting their website. You can also follow along onFacebook, Instagram and/or Twitter.